Scrape down sides of bowl. Turn mixer back on and slowly pour in remaining vegetable oil. Once oil has been added, continue mixing at high speed for another three minutes. Cover and place in refrigerator. Place panko in a dry non-stick pan and toast over medium heat. For order: In a mixing bowl, place 1 cup of Caesar Dressing, panko, parmesan and Italian seasoning and stir to combine. Use the small batch as needed for service. 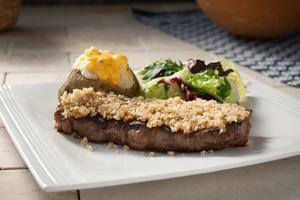 Cook steaks to order and finish each steak with a 2 Tbsp topping of Caesar Crust, evenly spread over steak.